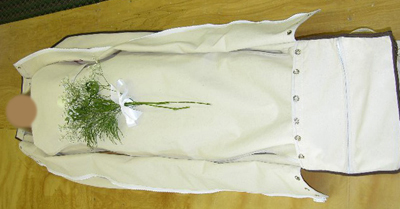 Our ocean-friendly Atlantic & Pacific Sea Burial Shroud® uses a similar concept to what sailors 300 years ago used aboard their ships…but with significant thoughtful design upgrades making it more durable and it is now suitable for funeral home viewings. Check our “How to order” page for all colors and options. 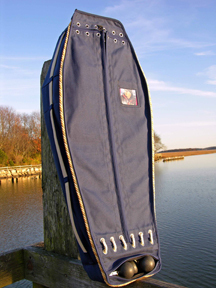 Constructed and sewn by genuine New England sail makers with decades of experience who use only natural “Grade A” untreated 10 oz cotton duck fiber material, sisal rope closure lacing, built in privacy panel and nickel plated chrome locking hardware — the finest system available for ocean friendly biodegradable sea burials. Our patent pending design has an independent chambered ballast weight system separate from the body compartment to ensure the shroud descends feet first to the ocean floor. Ballast is provided by authentic cannon balls that are smelted at the same historical Civil War Massachusetts foundry who has been supplying the Navy’s oldest commissioned warship the USS Constitution ~ ‘Old Ironsides” since the early 1800’s. Dimensions 6.5” x 37.5 lbs each. Includes a Memory Pocket™ located over the left chest that can hold photos, letters or mementos. Accent piping colors available: White, Navy, Daffodil, Wine, Sable and Sage. Price: $1,875.00 + s/h. 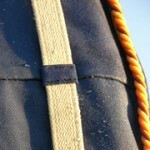 Custom accent patterns on the pall bearer straps can also be available in Tennis, Golf, Fishing, Boating and more. Includes Warranty, Sail Maker’s Certificate of Authenticity, Instructions, Spare Carry Straps, Sisal Closure Line and Privacy Lock. Made to order please allow 2 ~ 5 day production time. Natural is typically in stock. Express shipping is available for $95.00. Cannon Ball Ballast ( set of 4 ) are $350.00 + Appx $220.00 standard shipping / handling outside of New England. Free shipping within. 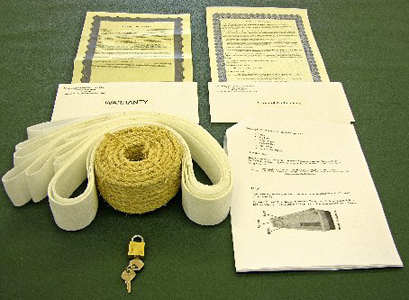 Atlantic & Pacific Sea Burial Shroud® – Ask for it by name. 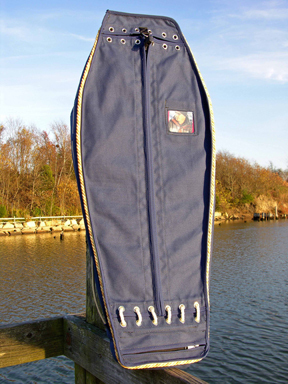 Four 37.5 lb cannon balls weigh down the Atlantic Sea Burial Shroud® for fast deployment. Hand crafted at the same historical Civil War factory in Massachusetts who has been pouring cannon balls for the USS Constitution “Old Ironsides” since the early 1800’s. Hand crafted from iron, these round shots are smelted to 6-1/2” in diameter, painted gloss black complete with a filed flat surface to prevent rolling while voyaging to sea. Certificate of Authenticity included.